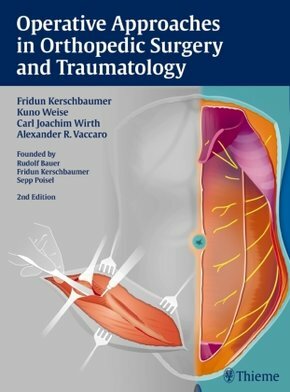 Named to the Thieme Classics series after fifteen years of acclaim from the medical community, this book depicts the major, standardized operative approaches in orthopedic and trauma surgery through series of illustrations that begin at the skin incision and advance to the target organ, particularly emphasizing surgery-related topographic anatomy. Meticulous explanations of the chief indications, hazards, and possible complications of each surgical approach accompany every procedure. Key features of this classic surgical guide include detailed illustrations from the surgeon's perspective-not the upright profile of most published clinical texts; diagrams of anatomic variants relevant to each operation; summary descriptions of each surgical approach's indications, potential complications, and dangers; and careful yet concise descriptions that make it easy for the reader to follow the book's step-by-step instructions. All orthopedic surgeons, residents, and medical students will benefit from this essential, treasured clinical text. The authors provide a unique operative guide, gleaned from years of evidence-based, clinical experience. From the cervical spine to the foot and ankle, each part of the body is divided into detailed subsections. Multiple approaches are included to treat common and rare musculoskeletal injuries, conditions, and diseases. The concise descriptions are complemented by meticulously crafted, labelled anatomical drawings illustrating each step of the procedure, from the skin incision to the targeted region to incision closure. Associated indications, patient positioning and preparation, precautions, and dangers are also summarized for each approach.This comprehensive, state-of-the-art atlas is an invaluable surgical resource for all orthopedic surgeons, residents, and medical students. Prof. Dr. med. Kuno Weise, Ärztlicher Direktor der Berufsgenossenschaftlichen Unfallklinik Tübingen.